The Kite - these are all birds of prey, that is, they live by destroying other animals, and some of them are very fierce and cruel. he kite is mentioned but once or twice in the Bible. In Leviticus, 11:13,14, it is named among the birds which the Israelites were not allowed to use for food. "And these are they which ye shall have in abomination among the fowls; they shall not be eaten, they are an abomination; the eagle, and the ossifrage, and the ospray, and the vulture, and the kite after its kind." These are all birds of prey, that is, they live by destroying other animals, and some of them are very fierce and cruel; I suppose this is one reason why they were not to be eaten. The kite is a large bird, more than two feet long; and when its wings are spread it would take a string five feet and a half long to stretch from the tip of one across to the other. It does not fly very rapidly, but its motion in the air is very graceful and beautiful. On this account it has sometimes been called the Gled, or the gliding bird. 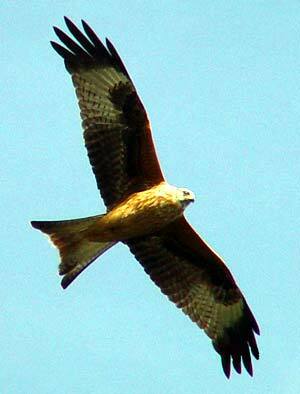 The kite is very much dreaded and disliked by those who have ducks and chickens, because it carries them off for food. It also eats frogs and moles: it is said that more than twenty of the latter have been found in one Kite's nest. It is a cowardly bird, and does not attack any animal that is strong enough to defend itself. Its nest is usually built between the forked branches of some tall tree in the thickest part of the forest; and if you could look into one of them in the spring, you would probably see three eggs, almost white, but a little tinged with blue.